"If all goes well, we will see not only what calculus is really about, but how to actually start doing it." 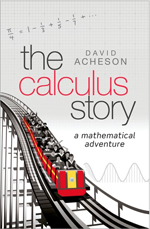 So promises David Acheson's unusual little book before embarking on a remarkably expansive and frictionless tour of mathematical history and theory. The prospect of actually "doing calculus" should not put off anyone: The calculus story is no textbook, even if it does present theorems and works through a number of examples. But neither is it a buffet of mathematical confections, such as Acheson's earlier 1089 and all that, though it is full of lovely and amusing problems. Rather, the book wants to impress on the reader the structure, evolution, and overarching program of calculus — why it is useful and why it is important. Even then, potential readers need not fear a dry contribution to the "history of science". The calculus story is too fond of juicy anecdotes. In fact, it is by blurring all these genres — combining real calculations, fun problems, and potted history, as it were — that The calculus story is so successful. It is the antithesis of the dreary way calculus is too often taught at schools and universities. The book is roughly split in three. The first third develops the basic mathematical machinery and explains its philosophy and historical background. We learn how the germs of calculus lay in ancient geometrical ideas and in the treatment of infinity, first explored by the Greeks and then advanced in the early modern period. Acheson then puts these ideas to work, explaining rates of change, areas under curves, dynamics, and infinite series. As any jaded student will tell you, these are standard topics encountered in late high school, but the narrative adroitly manoeuvres from historical anecdote to elegant and concise proof in a way that is irresistible. The proofs are generally geometric and hence more arresting (algebraic proof can glaze over the most earnest of eyes), numerous graphics and reproductions of historical manuscripts are effectively deployed, and the prose is never hurried or awkward. I often found myself wishing I had been taught calculus like this when I was 16. The middle portion of the book delves into the careers, and rivalry between, Newton and Leibniz. It presents an accessible and interesting introduction to their priority dispute and their underlying mathematical philosophies (what does "dx" really mean?). The latter are framed through Bishop Berkeley's entertaining and scandalous attack on Edmund Halley in 1734, A discourse addressed to an infidel mathematician. This is not only fun but also useful for students to see — because there are philosophical difficulties in dealing with calculus: if dx is vanishingly small how can it be different to 0 and, consequently, how can one divide through by it? Students should encounter real mathematicians struggling with these ideas, rather than being told only to remember the rules and how to use them. It is also valuable to see mathematics animated by history: it makes the subject more human, less remote, more like a living thing, and hence more appealing. Later in the book the Weierstrass limit is introduced, which helps clear up these issues. But for the most part, the last third is a rapid tour through more advanced topics, drawn from a typical university applied maths curriculum: differential equations, the calculus of variation, Taylor and Fourier series, complex analysis, and theoretical physics (quantum mechanics, chaos, etc.). At this point The calculus story is potentially frustrating, partly because of the speed at which the book runs, and partly because it hasn't given the reader the background to adequately tackle these topics. This section might best be considered a "teaser" — an advertisement to go ahead and actually do an undergraduate degree in mathematics. Overall, The calculus story is remarkably successful. With its fusion of worked examples, engaging and elegant proofs, historical anecdote, and philosophy, it is an example of a much more appealing way of teaching mathematics (and science generally). The reader does need some analytical geometry, so knowledge of up to Year 10 mathematics is necessary. On the other hand, it may be a little too basic for university students of mathematics. I see the book perhaps working best as a supplement for a high school student, the parents of such a student, or an adult wishing to reacquaint herself painlessly with material long forgotten. Henrik Latter is a lecturer at the University of Cambridge, where he works on the dynamics of Saturn's rings, planet formation, and the flows of hot plasma around black holes.